The study on the effects of aged garlic on chronic inflammation and immunity in obese adultswaspublished online in the latest edition of Clinical Nutrition ESPEN. It found that it usually takes an average of two weeks of consistent consumption of aged garlic before any reductions in chronic inflammations were noticed. The researchers studied 51 healthy but obese adults who had an average age of 46 and a mean Body Mass Index of 36. They were made to go through a parallel, double-blind, placebo-controlled randomized study to determine the effects of aged garlic extract on the immune system. The results were found to be statistically significant when compared to the control group. Garlic, with the botanical name Allium sativum, contains, allicin, a substance that is thought to give the herb its peculiar odour and taste. Allicin is also responsible for garlic's therapeutic properties. 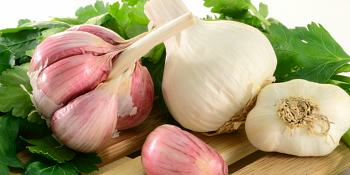 Previous laboratory studies have equally confirmed that garlic can kill certain parasites, bacteria. To get maximum benefit from garlic, it is recommended for one to eat a clove or two of raw garlic a day. Once garlic is absorbed by the stomach, it is removed via the lungs and the skin. This is why people who consume a lot of garlic regularly have to deal with the garlic breathe and sweat. However, aged garlic is said to be more odourless although less effective. Others also overcome the odour by taking coated garlic supplements which are made to dissolve in the stomach instead of intestines. The herb has been thought to reduce the severity and frequency of cold and cases of flu. Other ailments which garlic is thought to cure include high blood pressure and high cholesterolto more recent publications which suggest that regular consumption of garlic could significantly reduce the risk of stomach and colon cancer. Raw garlic when consumed orally have possible side effects which include bad breath, a burning sensation in the mouth or stomach, increased risk of bleeding, heartburn, gas, nausea, vomiting, body odour, and diarrhea. These side effects are often worse with raw garlic. Garlic may also increase the risk of bleeding and should be taken with moderation.